Israel Hasson's bill to make any website with over 50,000 hits a day be legally considered a newspaper and liable for the comments left in its talkbacks have passed preliminary reading in the Knesset. Now as a wave of censorship is hitting European and Canadian bloggers, that wave is now hitting Israeli bloggers as well. British blogger Lionheart's potential jail time made headlines and now a a blogger from Mystical Paths has been called in for interrogation for "possible involvement in planning anti-public activities, and for publishing a Violent Anti-Government and Anti-Homosexual Blog - Mystical Paths." 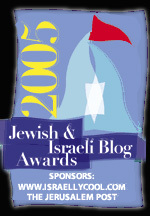 R. Nati is a former United States Marine but Mystical Paths is a primarily religious blog with a side emphasis on events in Israel. Mystical Paths is on the opposite spectrum of violent, as the name alone would indicate. Anti-Public activities is a creepily Stalinist term. It is critical of the Olmert government and as a religious blog it of course views homosexuality like any other sexual perversion but does not spread hate toward individuals. Neither of those two things should in any case result in a police interrogation but it was probably posts like these written by R. Nati detailing the police crackdown during Bush' visit that sparked the police's ire. A highly religious post that at the same time describes the abuse behavior taking place. But this interrogation is itself is a signal that the wave of crackdowns on Israeli bloggers is underway. government is trying to push through a massive series of terrorist concessions that the entire country opposes and it is trying to do so by silencing voices of protest wherever and whenever it can. Consider what happened during Bush’s visit when three activists attempted to hand out booklets to reporters about Fatah's terrorist activities. The detention of three activists during President Bush’s visit to Israel has sparked claims that Israeli police are intentionally targeting groups and individuals who oppose the push of Ehud Olmert’s government for a two-state solution. Following that is the letter from the mother of a 14 year old girl, who is an American citizen, incarcerated without communication in an adult prison. The ZOA, one of whose activists had been handing out the booklets, has also issued a protest in regard to the 6 such girls who are still in prison. The situation in Israel mirrors that in Europe where governments who are determined to sell out their own citizens to the Jihad pass laws and engage in police interrogations of anyone speaking out against it. Silence is the company policy and the graver the situation gets, the worse the crackdown becomes as governments become increasingly determined to silence anyone pointing out the disastrous course they are taking for their nation. The press tends to be well in hand, staffed by reporters produced by liberal institutions and managed by editors who vote safely to the left. Conservative newspapers are kept in line through threats and intimidation and the inevitable to need to compromise in order to remain in business and prop up their "moderate" conservative parties. The internet has changed the rules of the game. In America or in Israel or in Europe, the internet has become the main source of disseminating information about the rising terrorist and demographic threat from the forces of Islam. Governments who are determined to compromise with Islam are driven to find a way to silence those independent voices, by first creating laws and then using police harassment to silence independent websites and bloggers. The censorship sweeping the free world is meant to smother those few who are protesting against the dark wave of the Jihad approaching our shores. Censorship though is no solution but a frustrated political and media elite will still try to do their best to "silence the extremists." It is our sacred duty not to permit their voices to be silenced, across the world and around the globe, ex-Muslims, Christians, Jews, Atheists, Hindus, Right, Left and anything in between. We confront the prospect of a new dark age that will drown all we love in darkness and slaughter and enslave our families and those we care about. Every voice that shouts, whispers or murmurs against the darkness is the voice of freedom. I've only recently begun reading Mystical Paths and find it baffling that either of the rabbis that write it would be called in and interrogated. They both seem so sweet and gentle. I don't know them personally but that sweetness comes through their writings. It's the last blog in the world I would see this happening to. I hope R' Nati is okay. How scary to be called in for interrogation and initally not even know why. As for handing out anti-gay literature...are they next going to tell rabbis, ministers or priests that they can't tell their congregations that it is a sin? After the bloggers they'll next go after the clergy. You're 100-percent correct. We must all protest these strong-arm tactics in whatever way we can. Now that I think about it, I wouldn't be surprised at all if Olmert and his Olmerites start sending in undercover spies to moniter homilies given in synagogues. It wouldn't surprise me at all. What if a rabbi teaches that it is a sin to give His land away? Would the rabbi get hauled in for hate speech or extremism? In essence, outlawing Judaism??? From their paranoid perspectives, the Olmerites probably view rabbis as dangerous because they have congregations. If only they'd spend more time infiltrating the mosques. Great post. Things are very bad. Keli, the answer to your questions is that the Israeli government has been doing that for years, they have repeatedly and openly threatened Rabbis like Rav Mordechai Eliyahu and Rav Lior for brining actual Torah rather then cutting deals with the government to get money for their schools. Keli, you have to separate torah from the Israeli government. One has absolutely NOTHING to do with the other. These are thugs running a purely secular government that has no resemblance to what G-d originally planned for Israel. I spend a fair amount of time reading the Talkbacks on Israel's news sites. They are overwhelmingly anti-Olmert, anti-Kadima. Every time Ehud Olmert announces another lunatic surrender to the jihadists, whether by arming them, or releasing terrorist murderers or saying the outposts are a disgrace, what have you, the Talkbacks go nuts. Olmert is very much disliked within and without Israel. I believe this forum is powerful. Olmert wants to silence it is my best guess. For obvious reasons. Sharon silenced debate and criticism -- he ignored the Likud party vote which was overwhelmingly anti-disengagement; he bribed and fired cabinet ministers that dissented. Jerusalem lawyer, Ehud Olmert is Sharon's hand picked replacement. Ariel Sharon will forever be a disgrace to his people despite all his military heroism and valor. Sharon is a war hero, turned traitor. Olmert is a disgrace himself that has no redeeming virtue. This is what Sharon gave to Israel; a dishonorable leader. This is what Mr. Bush and Rabbi Yosef are attempting to prop up; a dishonorable man. B"H Thanks for the link and the information. I know what you mean, Lemon. What I meant was, the government could start persecuting rabbis just for teaching what the Torah says about Israel, if it contradicts messages the secular government wants to convey. As Steve pointed out, this is already happening. Keli Ata, I believe there may be a problem with some or many rabbis in Israel. Like Shas and United Torah Judaism, rabbis have become dependent upon and thus corrupted by government largess for their yeshivas and their social institutions. As a conservative, I believe government is the worst source for charity, though obviously there needs to be exceptions; maybe what Reagan called the social net for those that fall through the cracks. A few years back, I spent a few weeks in Jerusalem Yeshiva. As a Jew that grew up secular, this was a great learning experience for me. Some Jews spend a lifetime in yeshiva learning. I could never do this, nor would I. Back to my main point. After this I would contribute to this yeshiva. The rabbi called me annually. At a certain point, I thought to ask him, in all their classes and literature, why didn't they speak about the importance of all the land of Israel in terms of our covenant. He basically told me, the yeshiva did not get into politics and that was the end of his calls as well as my contributions. Seems to me, the land of Israel is central to Torah and to our covenant. How can any rabbi say that is too political unless they fear government funding might dry up? These Jews were not Heredi. I believe the rabbi told me they considered themselves moderate or mainstream Orthodox. Maybe we call this Modern Orthodox? For example, the rabbi told me he would counsel intermarried couples to see if he could bring them to more observance or if there were any interest in conversion on the part of the non-Jewish partner. Seems to me, this is not extreme. But when it came to the land of Israel and the government negotiating with Israel's enemies, they were silent. My guess would be, outspoken rabbis like Rabbi Waldman in Hebron, Rabbi Wolpe (who is Lubavitcher) and others receive their funding apart from government. Do you know? I guess I am looking at this is overly simple terms, but do a word association among most non-Jews. Say Israel and they'd almost always associate it with the Jewish people. I don't see why teaching Torah, particularly what it has to say about Israel, should be viewed as political, though I recognize that it has. No part of it should be left out of teaching. Where does this ultimately lead? Will it go from rabbis reluctant to teach about Israel to...(G-d forbid) scribes altering actual Torah scrolls when they copy them? That would be a disaster. But could it happen? It seems to me that if you go down the slippery slope of altering what Torah says about israel and deliberately misinterpreting it this could ultimately lead to altering the Torah itself and changing Jewish history forever. BTW--good news--the seven Israeli girls have been released from jail today after a day of prayer and fasting outside the prison. "He basically told me, the yeshiva did not get into politics"
This is the comment I received when I asked if we would study and pray for an undivided Jerusalem as was called for by the OU. I was told an 'important person' in the community would leave if we did so, therefore we wouldn't. And yesterday I asked if we could pray for Sderot using the prayer (http://www.israelnationalnews.com/News/News.aspx/12495700 ) composed by Rabbi Mordechai Eliyahu, a former Chief Sephardic Rabbi (Rishon LeTzion) of Israel. The answer was, "No." I am dismayed at the politically correct neutrality that is spreading to the Orthodox community especially in light of what is happening on Israel's southern border and the threat to freedom of expression. Are fourteen year old girls the only ones who will put their bodies in the way of this perverted anti-Jewish Israeli government? I'm wondering if the news about the supposed release in the English-language Jewish media is an attempt to call off the hounds? It is indeed good news that many Jews are staying true to the Torah, but upsetting that in Udiyah's case congregational prayer for Sderot was refused. Individual prayer is powerful but there's something about group prayer that seems much more so. 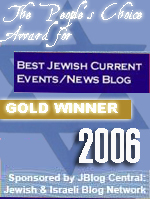 "Last week Olmert praised US President George W. Bush's friendship with Israel effusively. And yet, throughout his trip to Israel and the Palestinian Authority, both Bush and Secretary of State Condoleezza Rice made it clear that the Bush administration is no longer Israel's friend. Bush no longer insists that the Palestinians end their terror war against Israel before they can get a state. Bush insists that the Palestinian state must be "territorially contiguous." This means that he supports cutting Israel into two equally indefensible parts. "Although Olmert insists the US will take care of Iran's nuclear program for Israel, Bush took pains to make clear that Olmert is wrong to believe in him. The US president said that if Iran attacks Israel, the US will come to Israel's aid. That means that the US would only act against Iran after hundreds of thousands of Israelis were killed by a nuclear attack. That is, the US will only act when it is too late to do anything except prevent Israel from retaliating. In short, far from enhancing Israel's relationship with the US, in its infinite ineptitude, the Olmert government has come close to destroying it." The story about the girls arrested in Israel is extremely upsetting. So is the story about interrogated blogger. My cousin in Canada was telling me about things like that, but I was hoping that she was exaggerating. Unfortunately I was wrong. What can we do to stop this madness? Of course, Israel must always rely on themselves ultimately. A GOP administration will always support any Israeli attacks against Iran more then the Dhimmicrats will. Also, bloggers can email their stuff out of the country to be posted by team partners to 'their' blog. We will keep fighting for Free Speech, both 'the Left' and 'the Right' must take this stuff seriously. The Left seems the worst at preserving free speech just like it advocates other ways to curtail freedom. Sultan, I suspect Reb had a few too many details in his post, which the secret service or equivilent found to be potentially troubling (Semper Fi! to him). As for Mystical Paths, it seems a very innocuous site to bring down the wrath of the primary authorities, unless the investigation has elements of the "human rights" (the true slanderers of free speech and promotors of hatred) investigators. What has and is happening to the girls is simply impermissible in any decent society, especially if the full facts given are the basis of their detention and torture (it is that for girls of that age and sensibilities). In the quest that some have to impose a one world system, the sovereignty of nations and of individuals is being trampled. If they are willing to do that while our sovereign nations still exist, imajine what it will be when only the one totalitarian structure exists. That such is the plan, I have no reasonable doubts. The impositions (inquisitions might be the more proper term) by "the human rights" front group commissions are, I suspect, more inclined to begin the process of silencing free speech for everyone and to make all distrustful and isolated from each other (It is much that way where I am right now). The pattern is too broad over geographic areas to suggest that there is an isolated purpose. England, the USA, Europe, Australia and Israel are all being hit. The message is intended to make all writers and speakers shade their speech and then to become silent, and isolated, when faced with each others uncertainties about one another. It is not a racial or an ethnic, nor an individual nation which is undertaking this effort. Many concentrate on racial issues as being the problem, which it may be in some respects (high proportion identifiable as Jewish or Zionist), but there are powerful groups, who have operated with impunity on different planes from the rest of us, within all of our nations for years. They are now eager to implement those plans, and they apparently have some timeline in mind for their accomplishment judging by the increasingly open pressures. I would think that anyone who has Israels interests and prior freedoms in mind, as well as those who love America and Western freedoms, will find the changes we will undergo very disturbing. Effective resistence requires that we learn much more and we do have a necessity for the internet for that. One thing I would like to urge all to reconsider is their predisposition to prejudice regarding the BNP. I know and feel a bond of friendship with many of the regular members. I have encountered primarily concerns about the welfare of themselves, their families and of their nation, with it's historic freedoms. They are concerned, as all of us are, about the removal of their rights and freedoms. They understand that importation of immigrants has assisted in that, but the resistence is to those effects and are not concentrated on race as some suggest. LGF and some other sites have engaged in what amounts to slander in my opinion. Whether it is ignorance or a predisposal to attack anything with any racial component at all, I don't know. I do know that their overall characterasations are very incorrect. Attacking them unfairly is a disservice to all of us who are concerned with our freedoms and our sovereignties. Thanks for the link to my article above. I was unaware until I came over and saw it. You have a great site with good information. SK, Just wanted to give you my 10ag on the framework of Torah-observant groups in Israel. You are essentially correct regarding Haredi, religious Zionist, and liberal wing of orthodoxy in Israel. The "liberal" wing is pretty much on the fringe, and with the exception of nuts likes Melchior, is limited to English-speakers living in their own little fantasy worlds in Qatamon and Baq'a neighborhoods. More significantly is the division within the religious Zionist community. There are the "Toranim" led by Rabbis like Rav Lior (Kiriyath Arba), Rav Yisrael Ariel (Temple Institute), and Rav Levanon (Elon More), and until recently Rav Shapira ztz"l. This community appreciates Jewish sovereignty over the Land, believing it to be halachally warranted, yet questions the gov't when it leads the people against Torah at every turn, and not just on issues of Land control. We see the gov't regime as nothing less than the Helenist puppets before the Hashmonean uprising: treif. Then there are the Mamlakhti who advocate undying loyalty to the State. They refuse to accept any understanding of Rav A. Y. Kook than their own. They have a great following and charismatic rabbis like Rav Tau and Shlomo Aviner. Several of these rabbis teach their students not to refuse orders in the IDF, even when ordered to do something against Torah. These "rabbis" are confusing the people, have a very big publicity machine, and ignore the rulings of great rabbis of our time such as Rav Eliyahu and Rav Shapira ztz"l when it doesn't serve their interests. They are popular and have huge PR machines. They have nothing less than pulled the wool over the people's eyes. They are dangerous and will be our down fall if allowed to continue unquestioned.